Many people endure pain in the ball of their feet at some stage in their life. There are several reasons why, most of which are easily remedied, and even avoided altogether. The ball of the foot is the padded cushion right behind the toes. It is directly connected to the metatarsal region of the foot. We tend to feel pain in the metatarsal region more often because it takes most of the weight when we walk and run. As you get older, the likelihood of pain in the ball of foot increases. Symptoms usually include swelling and tenderness. The pain can also be accompanied by bruises, blisters, nerve pain, and burning. In this guide, we will look at metatarsalgia, how it is caused, how you can get instant pain relief and the measures you can take to prevent pain in the ball of your foot. 1.1 Why Do I Feel Pain In Ball Of Foot? 1.2 What Are the Symptoms of Metatarsalgia? 1.4 Do I Have Metatarsalgia? Metatarsalgia usually involves swelling in the metatarsal heads – the joint under your foot in the second, third or fourth toes. The condition can also be caused by swollen joints, tendons or dislocated toes which adds pressure to the padding. The pain and inflammation caused by metatarsalgia make walking problematic and running impossible. Pain can fluctuate from mild to severe depending on the cause and how well you are caring for your feet should you happen to develop a stone bruise. The good news is, pain in the ball of the foot is easily remedied. Why Do I Feel Pain In Ball Of Foot? Most people experience pain in the metatarsal heads at some point. This might be because the ball of your foot feels tender or numb, or you might have a shooting pain due to nerve damage. There are many ways to develop metatarsalgia – most of which can easily be avoided. In most cases, the pain will ease off in a couple of days to a week. Severe cases can last longer. Should this be the case, seek advice from a health practitioner that specializes with feet. High-heels and tight shoes add more pressure to the metatarsal region. If you are on your feet for long periods of the day in not-so-comfortable footwear, they could well be the culprit. Excessive training, playing sports, and dancing affects the ball of your feet can cause bruising on the ball of your foot. Excessive walking can also cause your metatarsal to become tender. This is quite common for tourists on city breaks. There is nothing you can do to stop time, and unfortunately, getting older is a process that causes aggravating symptoms in many areas of the body. As you get older, the fat pads in your feet start to thin and affect the ability of your foot to absorb shock and cushion the metatarsal bones. Older people that run regularly are more prone to developing metatarsalgia. People that are overweight typically suffer from metatarsalgia more often than normal because of the excess pressure on your feet. The extra strain the balls of your feet are under can cause swelling and make walking uncomfortable. A small break in the toe bones can lead to metatarsalgia. Stress fractures cause you to walk awkwardly which typically means shifting your weight to a localized region of the foot which could cause pain to flare up. A bunion (hallux valgus) is a swelling of the big toe and can cause ball of foot pain. People that suffer metatarsalgia due to bunions is usually due to a change in the positioning of the first metatarsal bone. If you do have bunions, talk to your doctor about fitting a bunion splint to help balance the weight across your foot. Abnormalities in the shape and structure of your foot can affect the distribution of weight and increase the likelihood of developing metatarsalgia. Flat feet and high arches distribute weight unevenly. When the second toe is longer than the big toe, issues can also arise. Hammertoes, or mallet toe, can also contribute to pain in the ball of the foot given the tendency to force the bone downwards. This is a condition that affects how weight is distributed across your foot, and the poor padding on the ball of your foot usually has to take more weight more often. If you live with diabetes and notice a bruise on the ball of your foot seek the attention of a medical practitioner immediately. People with diabetes are more susceptible to infections. The extent of pain your experience will depend on how you contracted pain in the foot. Injury symptoms such as swelling and bruising will also mean the area is more tender. The pain can be localized to one area of the foot or spread around the metatarsal region. Some people say that metatarsalgia feels like walking on a pebble – hence why it is sometimes referred to as stone bruising. When your metatarsal heads are injured, swollen, burning, or in any way abnormal, you will probably feel intense pain, especially when you put pressure on the area. As mentioned above, most causes of injury symptoms can be diagnosed to a specific cause. However, it is possible to contract pain or tingling in your foot from unknown causes. You may feel a mystery nerve pain or an imbalance in your metatarsal and not know how you got it. To understand the causes of metatarsalgia, it’s essential to find out more about the metatarsal region. These five bones distribute weight so that you can stand, walk and run. Trace your finger from the bone of one of your toes across your foot and underneath until you can feel your metatarsal region. When this region is damaged or imbalanced, the ball of your foot will be tender to the touch and may even have swelling or bruising. If you do feel pain in the ball of your foot, and it was not caused by any of the factors outlined above, you may have developed an abnormality with your metatarsal bones caused by a genetic disease or injury. Not all pain in the ball of your foot is attributed to metatarsalgia. The condition can be caused by medical conditions that are not directly relating to your foot but can affect your balance and movement which puts a strain in the metatarsal region. People that live with diabetes can develop diabetic neuropathy which affects the nerves in the foot and inhibits the feeling of sensations. Because of damaged nerves, people with diabetes are at risk of metatarsalgia because they are unable to detect how much impact the ball of the foot is absorbing. Doctors advise people with diabetes to avoid high-impact sports or leisure activities that increase the risk of injury to the foot. If you do have diabetes and notice a bruise on the ball of your foot, you should speak with your doctor or podiatrist as soon as possible. Joint pain caused by arthritis is another common culprit that can aggregate metatarsalgia. According to the American Orthopaedic Foot & Ankle Society, around 90% of people that have rheumatoid arthritis will develop symptoms in their feet and ankles. Rheumatoid arthritis is most common in older people and causes swelling and stiffness. Daily activities are subsequently affected because it is difficult to walk. Work with a podiatrist and learn some exercises that will help relieve the pain. Although quite rare, Freiberg Disease is shown to affect the second metatarsal head and can severely limit a dancer’s relevé. The disease is brought on due to the death of tissue in parts of the bones. When this happens to the bones in the ball of the foot, the area becomes tender and possible enlarged. 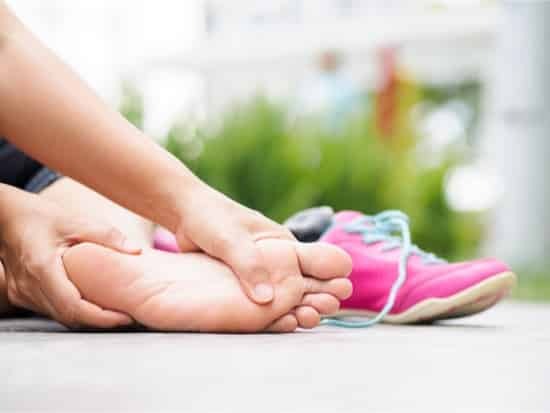 Freiberg’s disease is typically a condition that is the result of repeated stress on the second metatarsal head and mostly occurs in joggers and runner as well as dancers. The disease has also been associated with teenage girls going through puberty and are growing quickly. It is also found to be prevalent among affected people that have short or overly long metatarsal bones. Sesamoiditis occurs in the sesamoid bones of the foot. These are the tiny bones under the big toe joint. The condition typically occurs when the tendons attached to the sesamoid become inflamed. Therefore, tendon pain in the ball of the foot comes on gradually. Treatment typically involves abstaining from activities and resting the foot. If the area is enlarged, apply ice or use anti-inflammatory drugs to reduce to the swelling. Pain in the ball of the foot can also be the product of a medical condition known as Morton’s Neuroma. Injury symptoms in these cases are felt in the third and fourth metatarsal heads and us caused by the thickening of tissue that causes nerve pain. The condition of Morton’s Neuroma has been described by patients like you are standing on a pebble. A sharp, burning pain will be felt in the ball of your foot. The only way to relieve pain in the ball of the foot is to rest. Refrain from engaging in energetic activities that put stress on the metatarsal region. You can use an ice pack or anti-inflammatory pills to reduce any swelling. However, what you can do while you are inactive is targeted stretches that help release tendon pain and increase strength and flexibility. Practice stretches a couple of times a day until the pain in the ball of your foot has subsided. If your symptoms are related to broader issues such a Morton’s Neuroma, Freiberg Disease or Sesamoiditis, consult your doctor. Severe conditions may even require surgery. There are many home remedies and precautionary measures you can take to avoid developing metatarsalgia. The type of treatments available for treating pain in the ball of the foot vary depending on the severity of the condition. The treatments we have suggested below include both short-term and long-term solutions. The effectiveness may depend on the cause or severity of your condition. The balls of your feet need to be protected from too much heavy impact. If walking is painful, gel insoles or cushioned metatarsal pads will help relieve the pressure. You should also wear gel insoles if you play active sports that put heavy pressure on the ball of your foot. Gel insoles have shock-absorbers that help to cushion the impact when the ball of your foot hits the ground. In many cases, cushion insoles from your local pharmacy will be sufficient. People that suffer from medical conditions which contribute or cause metatarsalgia, gel insoles that mold into the shape of your feet provides added protection and comfort. If gel insoles from the pharmacy are not working for you, the best option is to have some orthopedic inserts designed. This option is more expensive but is more beneficial for people that are suffering from severe metatarsalgia. Orthotic inserts align the foot with your footwear so distribute weight more evenly. They also provide extra protection and comfort for the soft cushion in the ball of your foot. Excess body weight puts more strain on your toes and balls of your feet. This can lead to damage in the metatarsal region. If you’re overweight and suffer from metatarsalgia a lot, consider dieting and engaging in light exercise. You may want to consult a physiotherapist who can show you some effective exercises to lose weight, and also how to manage the amount of weight you apply to the balls of your feet. You can also install gel insoles or metatarsal pads on your footwear. As a short-term option for ball of foot pain, anti-inflammatory drugs provide instant relief and can help reduce the swelling. Over-the-counter drugs such as ibuprofen will suffice. You may also want to consult your doctor and ask them to prescribe you with a recommended non-steroidal anti-inflammatory tablet or another type of painkiller. If you are experiencing severe pain, you may need an operation or, at the very least, an injection of steroids. Pain on the ball of the foot can often be accompanied by swelling or a bruise. If your injury symptoms include burning or the cushion on the ball of your foot is enlarged, apply an ice-pack. The best way to apply cold therapy is to hold an ice-pack to the affected area for 15-minutes, then remove it for 15 minutes. Repeat this process for an hour twice a day until the swelling, and the pain subsides. Ordinarily, the pain should go within a day or two. If none of the home remedies described above work out for you, visit a health professional that specializes with feet such as a podiatrist or physiotherapist. They will perform some tests to assess the extent of the condition and determine the best cause of action. A general practitioner will usually prescribe anti-inflammatory drugs. If they don’t work, visit a foot specialist. For acute injuries, a steroid injection or corrective surgery may be the only option, but you should consult a specialist before making that call. In cases where non-surgical treatments have not been successful, and the ball of foot pain is getting worse, surgery may be the only option left. A foot specialist may initially recommend undergoing a steroid injection. Local steroid injections help reduce inflamed joints and help to rebuild worn tissue in the foot. In cases where you have a foot abnormality such as hammer toe, flat feet, bunions or nerve pain, corrective surgery is often the only option. Surgical operations involve cutting and removing a portion of the bone in your foot to shorten them. Alternatively, when bones need lengthening, foot surgery may also include resetting your bone structure or fuse joints together to align the bones and the joints. Ball of foot pain is a common occurrence in many people, but are generally caused by your lifestyle. If metatarsalgia is a condition that you experience regularly, then there are precautions you can take to limit the number of times you feel pain. Wearing comfortable shoes that fit properly reduces the likelihood of you contracting ball of foot pain. If your shoes are too tight for example, or there is insufficient cushioning on your insoles, your footwear will aggravate the pain in the metatarsal area. At all other times, wear footwear that is appropriate for the activity or occasion. High heel shoes are a cause of metatarsalgia in women, so avoid heels over a prolonged period of time and don’t wear high heels every day. For people that have foot abnormalities or large feet, consider having shoes professionally made to measure. Ill-fitting shoes that are not correctly aligned with your stance create an imbalance and can apply more pressure on the metatarsal region. Get into the habit of analyzing your footwear periodically. The wear and tear on shoes can affect comfort and performance which has a knock-on effect and can cause problems for the ball of your feet. Metatarsal pads and gel insoles should be replaced every six weeks. Sport is one of the main aggravators of metatarsalgia. If you do engage in exercise that puts heavy stress on the balls of your feet, you may want to consider switching to a low-impact sport. Ball of foot pain is easily cured in most cases. A couple of days rest will ease the discomfort, and you should be back to full fitness within a week. However, in the period following metatarsalgia, you should take precautions not to aggravate the metatarsal region of your foot. For those of you that do have a regular fitness routine, engage in light exercise, or low-impact sports for a while. Also, wear gel insoles in your shoes to cushion the impact on the balls of your feet. In severe cases, when the pain has not subsided after a couple of weeks rest, seek professional advice. For patients with foot abnormalities, it is imperative that you either find an effective method to manage the amount of weight you apply to the metatarsal region or undergo corrective surgery to cure the problem permanently.